The USTA Florida Jr. 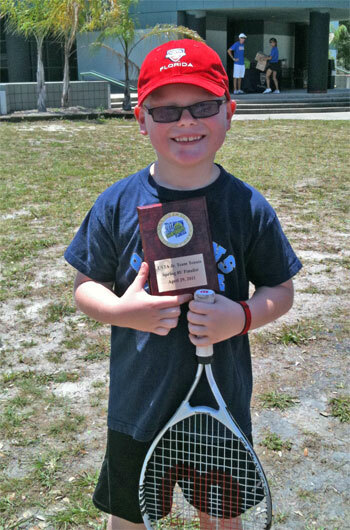 Team Tennis Section Championship for 10-under and 8-under divisions was held on April 29-30, 2011, at Tampa Tennis @ Hillsborough Community College, where two teams from Lake Cane/Eatonville (just north of Orlando) captured both the 10-under and 8-under titles. Sixty-four participants on eight teams competed in the championships, which were held on the 12 permanent 36-foot and six 60-foot-lined courts at the Tampa Tennis @ Hillsborough Community College center. 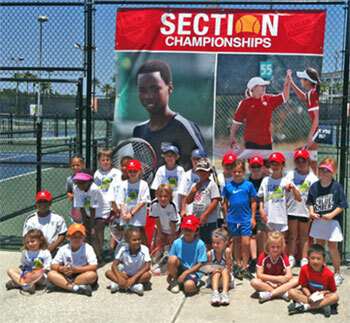 "This event was an eye-opener in regards to how important having the right size courts is to the success of a 10 and Under Tennis event," said USTA Florida Team Tennis Coordinator Michelle Willis. "Unless there was an adult standing next to the 36-foot court, you couldn't really tell the kids were playing on the smaller court size. It just seemed like the right size court for players, with the low-compression balls bouncing in their hitting zones and not over their heads." Players participated in a Friday night party before the beginning of Saturday play, with the player party featuring pizzas, a "candy bar," on-court games, a caricature artist, face painter, tennis and more. Play kicked off on Saturday, with team matches lasting 1 hour and 15 minutes. An awards ceremony followed, and winning teams were determined by games won in round robin play, with all children receiving participation awards. In the 8-under division the "United 8s" from Lake Cane/Eatonville finished ahead of "You Can't Be Serious" from Tampa Tennis @ HCC, the "Hernando Stingrays" from Hernando County, and "Little Aces" from the Sandra Freeman Tennis Center in Tampa. In the 10-under division the "United 10s" from Lake Cane/Eatonville finished ahead of the "Blue Bombers" from Seminole County, the "Hernando Mini Sharks" from Hernando County, and the "LOL Lakers" from Pasco County. Team entry into the event was open to all 10-under Florida tennis programs. The Lake Cane/Eatonville United 8s were coached by Elias Rivera, with the player roster of Abudullah Zaman (Orlando), Damon Huber (Windermere), Eriana Teague (Orlando), Ian Delgado (Orlando), Jeffrey Dumas (Casselberry), Kevin Vu (Orlando), Naiyla Dodson (Maitland), and Scarlett Huber (Windermere). The Lake Cane/Eatonville United 10s were coached by Elias Rivera with a player roster of Adam El Amrani (Winter Garden), Aysha Simmonds (Ocoee), Carys Huber (Windermere), Erica Simmonds (Ocoee), Jacob Johnson (Kissimmee), Mizani Ponder (Eatonville), and Sara Rintoul (Orlando). "The players and parents couldn't keep off of the 36-foot courts," Willis said. "They kept playing even when the matches were over. I hope to see many of these permanent facilities throughout the state. I would have loved to bring my daughter out to a permanent 36-foot court when she was beginning with tennis. The change in court sizes, balls, racquets, net size, and easy scoring are bringing more families together to play tennis." 10 and Under Tennis is designed for children featuring smaller court sizes, racquet sizes, low-compression balls, a simple scoring system, and net heights adjusted to ease kids into the sport. Similar mini-tennis formats have long been popular in Europe, where stars such as Roger Federer, Justine Henin and Kim Clijsters first learned the game with age-adjusted racquets, balls and court sizes. To see a video of 10 and Under Tennis in action go to: http://10andundertennis.com. For more information on local USTA Jr. 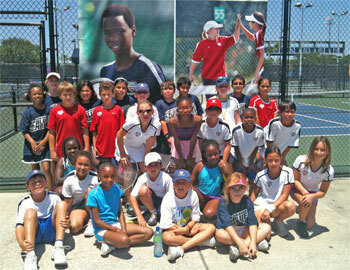 Team Tennis 10 and Under Tennis leagues in Florida, go to http://10andundertennis.com/.